The first quarter started well with two very fast goals, one from each team, and then over 4 minutes passed with no increase in the score. Some good defence and interception in the Magnet circle from Izzy and Rhiannon, and strong passing up the court from Lucy resulted in 5-2 at the end of quarter one. 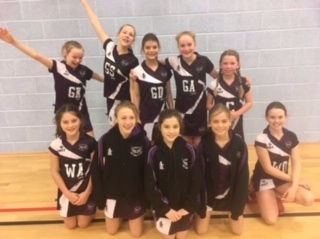 Cracking passing from Eva in centre and Sienna in wing attack took the Eagles 8-3, but some fantastic play from Magnet brought the score at the end of the second quarter to 11-6. A low scoring third quarter with the ball being played mainly in the centre of the court. Despite some good passing from Melody and Annabel, a strong Magnet side took the score to a nail biting 12-10. Eagles played well in defence against a strong Magnet attack and this combined with a final push from Isla and Imogen in the circle took the final score to 14-12. An exciting match and good play from both teams. Player of the match for Magnet was their excellent centre, and Isobel was POM for Eagles.